Blackberry-maker Research in Motion (RIM) has said it plans to refocus its business back onto corporate customers. The announcement came as RIM reported a quarterly loss, as revenues fell due to sharply lower smartphone sales. It has lost ground as its traditional business clients have switched staff to iPhones or Android smartphones. RIM also announced the resignation of former co-chief executive Jim Balsillie. Chief technology officer David Yacht will also be standing down. Shipments of Blackberry smartphones in the quarter fell to 11.1 million, down 21% from the previous three-month period. 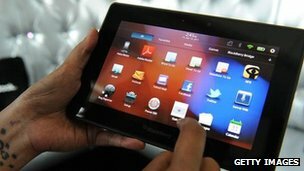 Shipments of the company's Playbook tablet hit 500,000, largely due to substantial discounting. For the full financial year, the RIM made a net profit of $1.2bn, down from $3.4bn in the previous year. The results were worse than analysts had expected and shares in the company fell as much as 9% in after-hours trading in New York. They have fallen by 80% over the past year. Once heralded as one of the fastest-growing companies in the world, RIM has struggled to keep up with rivals in the smartphone market, such as Apple's iPhone and handsets running on Google's Android operating system. It has also struggled to gain a foothold in the tablet market. "RIM has only sold 5% of the smartphones sold in the US in the past three months, Apple have 43%" said CNET analyst Larry Magid. " "They may be doing well in some of the developing countries but clearly in the developed world they are not doing well, both Apple and Google are doing much better," he told BBC News. Just three months after his appointment, chief executive Thorsten Heins said the company would now focus on its traditional core market of corporate customers rather than on individual consumers as part of a strategy to turn the business around. "We plan to refocus on the enterprise business and capitalise on our leading position in this segment," he said. Blackberry is popular amongst young people in the UK for its Messenger service and because it is cheaper than many of its smartphone rivals, which means they don't bring in serious revenue. "Teenagers are not their main market. They don't want to spend money catering to that business. "Their bread and butter is the big corporations, big government agencies who buy them by the thousands," Mr Magid said, explaining the reason behind the shift in focus. RIM was keen to stress that it was not withdrawing from the individual consumer market entirely. Blackberry will focus on the cheaper end of the consumer market, rather than trying to provide the kind of services offered by Apple's iPhone, the BBC's technology correspondent Rory Cellan-Jones says. As well as increasing subscriber numbers, the company said it is also keen to increase the amount existing customers spend. "We have new BlackBerry 7 devices scheduled to come out in the next few months to reinvigorate our position in the key entry-level smartphone segment, to support our efforts to continue growing our subscriber base by upgrading feature phone customers to smartphones," the company said in a statement. The launch of Blackberry 10, expected later this year, and a much-delayed new operating system, are expected to be crucial to its turnaround plan.